If someone would ask me what I believe to be the best products from the Italian 1970s period I'd most definitely say that the Soriana Sofa has a special place in my heart. Is this related in any way to the fact that I owned this sofa for so many years (about 30 to be precise) and it saw my kids grow up and my life constantly shaping between the usual highs and lows? I have a pretty detached relationship with every piece I sell, to me it is business after all, but every time I let go of one of the Soriana sofa my heart melts with pride, nostalgic feeling and a pinch of uncertainty because I bug myself with the same question over and over again: 'is my client really aware of how much love was put into this and what fantastic piece he is buying?' Some pieces are just objects, some deserve more recognition. My first Soriana Sofa is still there, sitting in the same living room, so when I started this business which I love so much and the chance presented to me I could not resist. I purchased a whole set and wanted to make it shine again; I went to Italy and start interviewing different restorers. After an extensive search I partnered with an Italian restorer who had work with these iconic design pieces many times before and knew them pretty well. If only my customers would know the passion, time,love, attention my staff and myself put into these projects! From the outsourcing of the pieces out of private Italian estates or auction houses to the final step there were endless telephone calls, meeting, leather testing, and a lot of extra work. Before digging into the restoration process i think the Soriana Sofa deserves an introduction: It was designed by Tobia Scarpa in 1969 and won the Compasso D'Oro award which is a very famous design award originated in Italy in 1954 by the La Rinascente company from an original idea of Gio Ponti and Alberto Rosselli. The same year other great Italian architects were recognized for their designs such as Franco Albini and Achille Castiglioni. The idea of the Soriana was to express a design where a whole bundle of fabric was encapsulated by a metal frame. It was a revolutionary and unique design and 50 years forward it is still one of the preferred sofa for some of the biggest designer and architects own homes or customer projects. The collection at the time was made of multiple single elements: a lounge chair, medium sofa and larger version sofa, chaise lounge with ottoman. 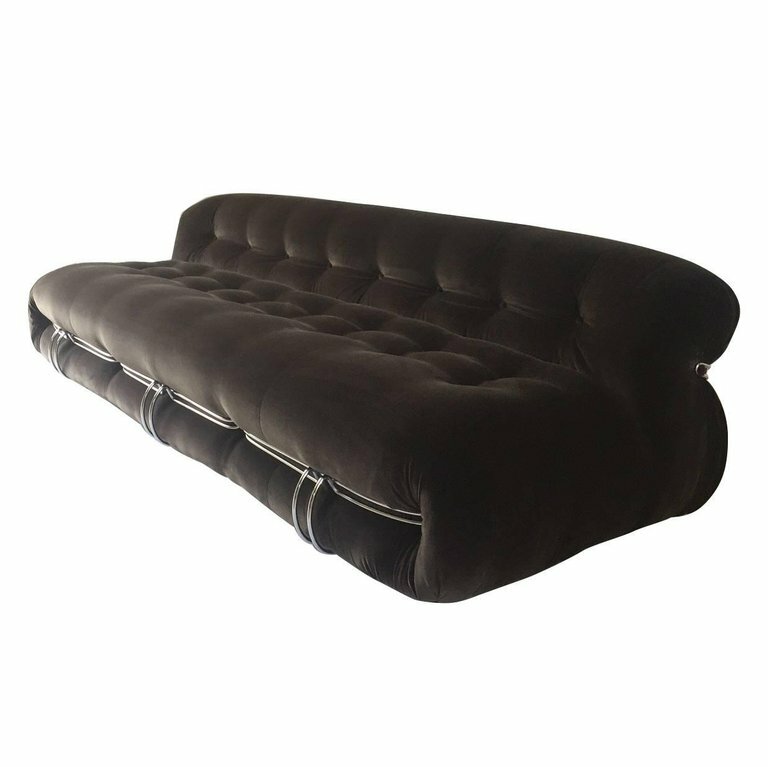 Today Tobia Scarpa Soriana sofa is not anymore in production and those rare pieces can be found on the second market at private estates or auction houses. Being a sofa of about 50 years of age the condition these pieces are found in is often fair, the cushions might be deflated, the fabric worn or ripped and the metal structure can be chipped and rusty. We love the idea of giving a new life to this iconic piece so it can be used for many more years to come. Well, after the introduction now it's time to bring you face to face with the long process of restoration! read more below! You have to know this piece very well to understand that due to its exquisite design it requires a special kind of material which works well with its many different curves and folds. While it might get easier with fabric, leather is a different story. The outcome is also very different though. 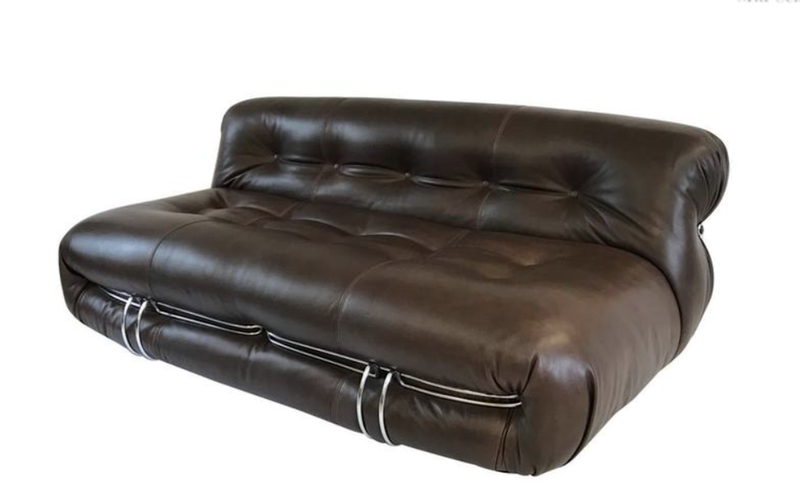 This sofa in the right leather is definitely a killer, a totally different luxurious effect. We had to find a leather with the best possible "hand" one of a certain thickness but with a certain grade of softness so it can be worked out easily. We found a perfect leather from an Italian family owned tannery with perfect vintage hues of browns and black and tan colors. Every batch of this leather is one of a kind, non toxic and with a wax finish on the surface which allow to get that vintage effect with the use while keeping its strength and beauty throughout the years. The first step is very important : assessment. The piece is basically ripped apart so that the internal elements condition can be assessed. Restoration of a Soriana Lounge Chair - we basically tear it apart and check all of the foam and structure. Soriana Sofa Restoration phase 4 - The Leather process a very important step! The naturaleness of this leather is incredible! Natural veins and signs because minimally chemically processed, the color outcome is one of a kind always, the natural signs of the leather as these veins are completely normal! If customer requires, we can also offer new chrome bath for the metal structure and if required because they are too damaged the plaques are touched up. The Soriana Sofa is restored! How does it look? The job was complete ! Naturally each restoration is a story by itself, every piece is a different story as well as the outcome, remember these sofas were made in the 70s lived for 50 years and each one of it is and will always be one of a kind for sure ! Do you want to purchase this incredible piece of design? Contact our office at 212 366 1777 or by email at contact@italianmidcenturyfurniture.com and inquire about availabilities. You might get lucky ! Designitalia Mid Century Modern imports authentic Italian Mid Century Furniture directly from Italy. You will find a unique collection of Mid Century Modern Sofas, mid century lounge chairs and dining chairs, accessories and much more. Posted on July 4, 2018 by Modern Italian Furniture Admin and filed under mid century seating and tagged Soriana Sofa Soriana Sofa Cassina Soriana Tobia Scarpa Tobia Scarpa.